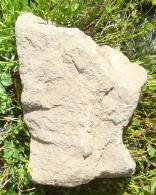 It's not every day that you find a rock shaped exactly like your home state! That's something cool to take home and keep forever for a souvenir to rekindle memories of a great trek through the mountains. Besides, it's just one little rock. Now, that's a difficult choice to make in regards to Leave No Trace. Will taking one little rock really impact the experience of any other person that visits the area? Probably not. What are the chances that any other person will ever even see that rock, let alone recognize it looks like Minnesota? Probably zero. Will the rock wilt, rot, or decay once it is taken from the environment and brought home, like a flower, stick, or bone? Nope, it lasts forever. A picture weighs nothing - taking the rock means you carry more. This picture can be shared around the world on the 'net instead of the rock stashed in a box at home. You know the rock is still out there and we might see it on another trek. Or, someone else just might see it someday. There are tiny critters living on the rock, even if we can't see them. In our case, there actually was not much discussion. The rock was found and passed around. I asked what the plan was for the rock and the scouts said they needed to leave it there. They had their expectations set before we even started our trek that we'd be following the Leave No Trace principles to our best ability. So, there wasn't much disappointment at taking a picture and putting it back. Once the principles are understood and the expectations set, minimizing your impact on treks, campouts, and other outings starts becoming just the new way your group does things. It's not an ongoing struggle of enforcement. But, there is always room for improvement or change in techniques and decisions.